ECO-CONSCIOUS PACKAGING IN ITS PUREST FORM From electric cars to sustainably designed packaging, the demand for eco-conscious solutions is irresistibly strong – and growing every day. The Duni ecoecho® range enables you to meet this need with top-quality, convenient take-away solutions for every need. These are made with the best mindful materials available, like bagasse and cardboard. Ecoecho® materials that show the future is in our hands. apartments. There are 162 studio apartments at the property, 19 of which offer views of the Burj Khalifa and are thus called Burj Studios. For those looking for even more spacious rooms, the property offers 16 onebedroom apartments and a Burj Suite that faces the Burj Khalifa. When it comes to the interiors, every corner of the hotel has a story to tell. Right from hand painted pieces of art from local artists, to the music for the common areas. The property also offers wellness facilities like a gym, spa, and a 24×7 business hub. Guests can also tuck into an all-day Italian dining venue Ecco restaurant. HH Sheikh Mohammed Unveils Dubai Airports’ New Identity Dubai Airports’ new DXB brand aims to position the world’s busiest international airport as a major destination for culture, hospitality, and entertainment. Millions of travellers passing through the world’s biggest airport, Dubai International (DXB) will soon get to experience unmatched hospitality, a culture of vibrant imagination, as well as a mesmerising mosaic of exciting and inspiring experiences, ranging from mouth-watering cuisines, evolving retail choices, to world-class music and art. After welcoming one billion passengers, the airport is transforming towards creating immersive experiences that embody the true spirit of Dubai for its customers, as part of its new brand reveal. VIPs and global media. To bring the brand to life and to demonstrate the spirit of Dubai, DXB partnered with XDubai, the masterminds behind some of the most thrilling experiences in Dubai, to deliver an incredible one-of-a-kind stunt by Emirati extreme athlete Mohammed Baker. The stunning showcase saw what is believed to be the world’s longest free fall attempt that began with a jump out of a helicopter and a glide down Sheikh Zayed Road with the iconic Dubai skyline as backdrop, before swooping under eight lanes of traffic. The stunt embodied Dubai’s spirit of adventure and ambition, and symbolised the vision of DXB to push boundaries and create exciting new experiences. business at Hilton and we have a 100 year history of pioneering culinary innovations,” said Simon Vincent, president, EMEA, Hilton. systems and operational excellence with Six Senses’ luxury, resort and spa expertise, IHG sees the potential to grow the Six Senses estate to more than 60 properties globally over the next 10 years. This includes bringing Six Senses to important urban markets, with a property already under construction in West Chelsea, Manhattan, New York City. Keith Barr, chief executive officer, IHG, commented: “Six Senses is an outstanding brand in the top-tier of luxury and one we’ve admired for some time. You only have to look at its iconic hotels and resorts to see how this acquisition will further round out our luxury offer. With a focus on wellness and sustainability, Six Senses has been voted the world’s top hotel brand for the past two years, which is testament to its impressive management team who bring deep experience to IHG’s luxury operations. •	IHG has agreed to acquire Six Senses Hotels Resorts Spas and its management business for $300 million in cash. •	Six Senses is an asset-light business. It manages 16 hotels and resorts (1,347 rooms), and there are a further 18 management contracts signed into its development pipeline. The open hotels include two properties for the upscale resort brand, Evason. With a further 50 deals under active discussion, IHG expects to accelerate Six Senses’ growth globally to more than 60 hotels over the next 10 years. •	The acquisition includes the entirety of Six Senses’ brands and operating companies and does not include any real estate assets. It includes Six Senses’ spa operations, which are core to the brand’s luxury and wellness positioning. Six Senses operates 37 spas in total under the Six Senses and LivNordic brand names, and also provides spa consultancy services. The Six Senses management will remain in place. •	Six Senses currently generates fee revenues of more than $13 million. The acquisition is expected to be EBITDA breakeven in year two and to generate a return approximately equal to its cost of capital by year four. •	For tax purposes, the transaction constitutes an asset sale for the purchaser, and as such IHG will be entitled to amortise the assets acquired. It is anticipated that the relief associated with this amortisation will reduce IHG’s future cash taxes by approximately $75 million. terChef, the TV Experience, will instantly feel in familiar surroundings with the restaurant’s quasi industrial interior design, complete with a dedicated drinks bar – inspired by the recognisable setting of the TV series. Food will be served on classic white ‘casual’ china. Contestants and champions from the worldwide series will share their stories and experiences with guests through signature dishes served during short-term residencies at the restaurant. The First Group will work with Endemol Shine Group to grow the MasterChef, the TV Experience, concept worldwide in coming years. “The fact Dubai will launch the brand to the world is a truly significant moment in the city’s restaurant evolution,” added Fraser-Smith. Sustainable Sourcing Mahak Mannan speaks to some of the leading F&B businesses in the region that are making a conscious effort to run their day to day operations in a sustainable manner, to find out the key aspects suppliers should know about the F&B market in order to create the perfect match to work towards a greener industry. Outlets managed: Brunswick Eatery, Bar & Terrace, Tom & Serg, The Sum of Us, Common Grounds Top five products in demand: Coffee beans from Ethiopia, organic eggs, Mexican avocados, organic bakers flour, extra virgin olive oil from Greece. Outlets managed: 14 Top five products in demand: High-quality mozzarella cheese, pizza topping proteins like pepperoni and sausage, chicken tenders and wings, pizza boxes, organic produce. Outlets managed: 14 branches in addition to sub-franchises. Top five products in demand: Prime angus beef patties from the US, leafy lettuce, tomatoes, cheddar cheese, locally produced brioche buns. Jumeirah Restaurant Group Outlets managed: Al Nafoorah, Flow, Pai Thai, Perry & Blackwelder’s, Pierchic, Segreto, The Noodle House, and Trattoria Toscana Top five products in demand: Biodegradable Kitchen paper rolls and garbage bags, fresh meat, fish and vegetables. Outlets managed: Two Top five products in demand: Meat, flour, vegetables, eggplant, yogurt. Under cleaning chemicals: dishwashing liquids, cleaning agents, hand sanitisers, food sanitiser. A monthly column by Martin Kubler, CEO, chief cook, and bottle washer of sps:affinity Strategic Partnership Solutions. peewee potato, and olives in a dijon vinaigrette to beet hummus with oregano cream, and dukkah avocado with spicy greens, preserved lemon, and tomato jam. Entrees include green herb tacos filled with roasted squash and king oyster barbacoa, and a wild mushroom sandwich with caramelised onions and truffle aioli. Diners can end their meal on a sweet note with coconut cream pie, or coco-berry mousse with hazelnut gelato, to name a few. The Hotel’s Bay View Lounge features large floor-to-ceiling windows offering views of Bahrain Bay and Manama’s skyline. the F&B industry. Be unique and find your own style, don’t copy on what’s popular, focus on creating your own style. How do you pick the right supplier in the UAE? Checking the supplier for their consistency and ensuring that they are able to continuously supply the quality of goods that you require in the volume that you require, along with how prompt they are in sorting any last-minute requests, is key to pick the right partner. sections like From the Chaat Trolley, From the Earth, From the Land, From the Sea, and From the Halwai. This inspires a sharing-style feel, where dishes are put in the centre of the table and all guests pick and share together. The hero dishes are raj puri chaat, KFC or Kerala fried chicken, Keralan chilli beef fry, and the Indo Chinese take on a sweet-sour chicken. What are the biggest challenges in the dining scene in Dubai? I find that the diners in Dubai tend to have a rather short attention span, they always seem to be looking for the next big Instagrammable thing to come out in terms of F&B. With all the table theatrics and props that are used when serving food in Dubai, the digital reputation seems to be the solution to heighten an experience whilst dining in Dubai. However, this has nothing to do with the quality of the food or the actual cuisine being served, so sometimes it’s hard for people to differentiate between an experience or the show, of a venue, and the actual dishes being served, the quality, technique, and execution of its cuisine. What are the most challenging items to source? In Dubai, nothing is really a challenge to source, however I’ll admit for certain items you do need to give them plenty of notice. For ingredients like a rose jam, you do need to give time, but they are still accessible. If you are looking at a local supplier for local food, it is a little difficult, because getting the precise ingredients or products in the volume that you need can be a bit of a challenge. What goals have you set for Indya by Vineet? Our short-term goal is to make Indya by Vineet a local destination and favourite amongst the community, so families can come and enjoy meals together. Long-term goal would be to have more of Indya in other parts of the region. wizard at 18%, engagement on maps at 12% and reviews at 7%. Given today’s mobile-dominant landscape, businesses should consider designing for the smaller screen size first. If you can get the information right on the small screen size then expand to desktop, you'll likely meet the needs of the vast majority of travellers. At Expedia Group, we have found that intuitive icons rather than descriptive words allow you to provide more in a smaller space, enabling mobile users to navigate and find what they need easily. Mobile travellers embrace mobile payment solutions. They not only use the expected credit cards and direct debit, but embrace conveniences of e-wallets like Apple Pay and PayPal. But localisation and choice are key to reaching mobile customers. Expedia Group has expansive offerings to include local e-wallet payment options such as Masterpass, JCB, Alipay and Paysbuy. In addition, customers can also choose to pay by installments, via IBP or with loyalty points. conversion tool. However, across most parts of the world, mobile now accounts for more than half of the online transactions, and in-app sales dominate. Latin America is emerging as the fastest-growing region for mobile transactions – with their share up 50% year-on-year while Europe is growing at 28%, and the US is increasing by 22%. APAC advertisers with a shopping app generated an incredible 75% of transactions via app or mobile web. For hoteliers, the big opportunity is in mobile deals. Our data reveals that seven in 10 mobile bookings come from deals. In Australia for example, 88% of travellers are looking for deals on mobile and new research released by PayPal shows the rise in impulse buying on mobile amongst Australians, with 77% of mobile window shoppers actually impulse buying. The use of deals is high for customers across the globe, up to 91% for American and Canadian travellers, 88% for Chinese and British, 80% for the Japanese, 70% for the French and 68% for Germans. Pitfall #4: Leveraging Timelines Mobile has long since been touted as a source of same-day bookings and the go-to tool only when hoteliers need to fill rooms last minute. However, Expedia Group data shows that mobile booking windows span the full spectrum. In certain major vacation destinations like Lanzarote, Spain the booking window for mobile stays average 65 days, the same booking window average as non-mobile stays. Long booking windows aren’t just limited to resort island and beach destinations either, cities and destinations around the world such as Venice, Italy (52 days), Denali National Park AK (49 days) and, Okinawa, Japan (46 days) also generate mobile bookings well over a month in advance of stay. Mobile travellers are equally valuable when filling rooms for extended periods. Even in resort destinations such as Punta Cana in the Dominican Republic where non-mobile trips are booked on average for five days, mobile stays averaged a comparable length at just over four days. Pitfall #6: Consistency Let’s face it hoteliers are under the pump, and the constant innovations in technology that sparks convenience for consumers can sometimes actually put more of a squeeze on hotel resources. Hoteliers often fall into the trap of establishing a great mobile strategy but then cross it off the list and fail to continuously test, learn, and evolve. It might sound like more work, but instead, we’re seeing savvy hoteliers really utilising the assets of their technology partners to get big results for little input. As an example, the Partner Central mobile app allows hotel partners to better manage their business across Expedia Group’s portfolio of travel brands and supports hotel’s engagement with their guests anytime, anywhere. Critical data provided on-the-go helps them stay competitive with real-time insights about the market, allows them to read and respond instantly to feedback from guests, and receive important notifications with time-sensitive information. Similarly, innovations in hotel operations, with tools like mobile check-in and check-out keeps hotels up-to-date with the ever-changing traveller expectations. 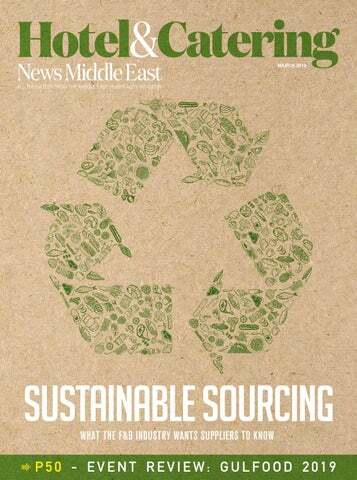 Marcus Toft, area manager, Duni Middle East & Africa, tells us why the company is rethinking its strategies in order to facilitate a shift towards sustainable packaging. The 24th edition of the world’s largest annual food and beverage trade show reinforced its reputation as the ideal trading platform for F&B specialists to display their latest innovations. With thousands of global reveals and new launches rolled out across the 1,000,000 sq. ft exhibition at Dubai World Trade Centre (DWTC), we round up all the action from the five-day show. Paška Sirana Aims To Enter The Middle East Market Martina Pernar Škunca, marketing manager, Paška Sirana “Our company comes from Croatia on the island of Brac where we produce cheese exclusively from sheep that live on the island. “We are currently not present in the Middle East market but we hope to start to work here soon because it’s a very interesting market and our product is an exclusive product, not for everyday consumption. “In recent times, our cheese has won a lot of medals at international events and is the most awarded Croatian cheese. The top quality of milk is an important factor in our cheese along with the sheep that graze on the little grass grown on our island making it a very unique product." Gianpaolo Bruno, trade commissioner to the UAE, Oman, and Pakistan, Italian Trade Agency. Karl Devlin and Sheetal Rishi, business development managers, Invest NI. NZTE Aims To Diversify Its Products Kevin McKenna, trade commissioner, NZTE, UAE and Qatar, and Consul General in Dubai. Unmatched food production and quality. With up to four ovens in one, countertop models are ideal where space is at a premium and you need the flexibility to cook what you want, when you want it. They feature a compact footprint and ventless operation. The perfect solution for high-volume food production in a small space.